(Nanowerk News) For all the promise of graphene as a material for next-generation electronics and quantum computing, scientists still don't know enough about this high-performance conductor to effectively control an electric current. The researchers demonstrated that when electrons are rerouted at the interface of the graphene and its semiconducting substrate, they encounter what's known as a Schottky barrier. If it's deep enough, electrons don't pass, unless rectified by applying an electric field – a promising mechanism for turning a graphene-based device on and off. 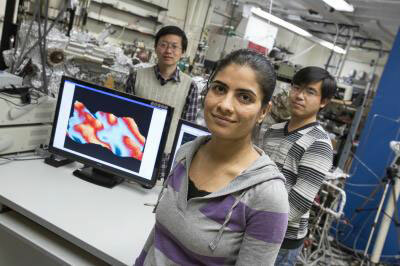 UWM doctoral student Shivani Rajput, first author on the paper, shows a reconstructed image of graphene with the ripples clearly visible. Two postdoctoral researchers also worked on the project: Yaoyi Li (left) and Mingxing Chen. The research group, led by Lian Li and Michael Weinert, UWM professors of physics, and Li's graduate student Shivani Rajput, conducted their experiment with the semiconductor silicon carbide. The results were published in the Nov. 21 issue of Nature Communications ("Spatial fluctuations in barrier height at the graphene–silicon carbide Schottky junction"). "Our study says that ripples affect the barrier height and even if there's a small variation in it, the results will be a large change in the electron transport," says Li. The barrier needs to be the same height across the whole sheet in order to ensure that the current is either on or off, he adds. "This is a cautionary tale," says Weinert, whose calculations provided the theoretical analysis. "If you're going to use graphene for electronics, you will encounter this phenomenon that you will have to engineer around." With multiple conditions affecting the barrier, more work is necessary to determine which semiconductors would be best suited to use for engineering a transistor with graphene. The work also presents opportunity. The ability to control the conditions impacting the barrier will allow conduction in three dimensions, rather than along a simple plane. This 3D conduction will be necessary for scientists to create more complicated nano-devices, says Weinert.